Perth Airport is the major transport gateway to Western Australia, and as such is one of Australia's busiest airports. Our Perth Airport guide includes contact details as well as information regarding terminal facilities, public transportation routes and nearby hotels. In response to continued criticism from governing bodies the airport is undergoing a huge redevelopment scheme, which will see the airport completely transformed by 2024. The biggest planned change involves the domestic and international terminals being consolidated into a single terminal complex. There is a self-help information centre on the ground floor of the international terminal. Volunteer customer service officers, who are recognisable by their distinctive gold jackets, are also available to provide information and answer enquiries. For the international terminal, travel east along the Great Eastern Highway from Perth city centre, turn right onto Tonkin Highway and head southeast, turning left at Horrie-Miller Drive. For the domestic terminals, travel east along the Great Eastern Highway from Perth city centre and turn right at Brearley Avenue. The international terminal and the three domestic terminals are located 12km (7 miles) apart. Transfers between the international and domestic terminals are by free shuttle bus or by taxi. Bus:Bus 37 (tel: +61 8 9428 1900; www.transperth.wa.gov.au) operates between the domestic terminals and the city centre. Shuttle:The Perth Airport Connect Shuttle (tel: +61 8 9277 4666; www.perthairportconnect.com.au) meets every arrival within 30 to 45 minutes and operates between both domestic and international terminals and the city centre (journey time: 45 to 60 minutes; fare: A$15). The Fremantle Airport Shuttle service, which runs to Fremantle – a suburb of Perth, is also available. Taxi:Taxi ranks are situated outside the domestic and international terminals; travellers may be required to pay their fare in advance. The same fare applies for either a single person or a group, and is around A$40 to the city centre. There are several bureaux de change kiosks at the airport; some of which also offer travel insurance. ATMs are available in the terminal buildings. There are several restaurants, bars and cafés before and after security screening in all three terminals. Among these outlets are a pub and a wine bar. An extensive range of duty-free goods is available in the international Terminal 1. Numerous other shops offer a wide choice of items, including local specialities, designer clothing, newspapers and magazines. You can report lost (or found) property via a form on the airport's website (http://lostpropertyhelp.com/). Further assistance can be provided at the airport's information desk (tel: +61 8 9478 8888). Left-luggage lockers are located outside both the international and domestic terminals. Baby changing rooms are available in all terminals. Showers are also available. A non-denominational quiet room for prayer or quiet contemplation is located on the ground floor of the international Terminal 1 – an outdoor playground for kids is also located just outside this terminal. A first aid service (tel: +61 8 9478 8572) is also on hand to deal with medical emergencies. There are no conference facilities at Perth Airport. The Comfort Inn Bel Eyre (tel: +61 8 9259 3888; www.comfortinn.com), 4km (2.3 miles) from Perth Airport, can provide meeting and conference facilities for up to 100 delegates with audiovisual equipment for hire and catering available. There is a postal service at Perth Airport. Mobile phone hire is available. Internet access kiosks are located in all terminals, and paid-for wireless internet access is offered on-site. 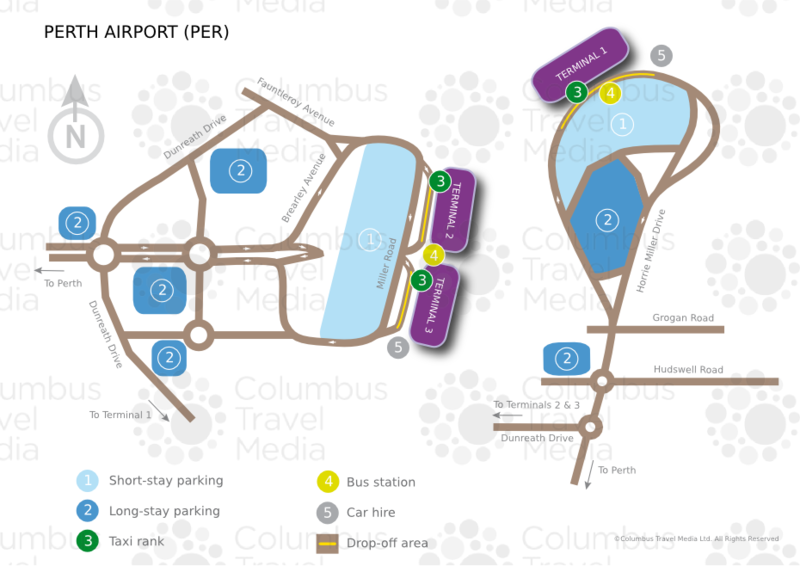 Perth Airport is fully accessible to disabled passengers. Wheelchairs are provided on request for passengers to use within the terminals, subject to availability. There are large parking areas at the domestic and international terminals, directly in front of the terminal buildings. Short- and long-term parking is available in these areas. Secure, undercover car parking can be found at the domestic terminal's 'fast track' facility in car parks 1 and 2 – short-term and long-term rates are offered here. Complimentary buses serve the long-term parking areas. Car rental companies Avis, Budget, Europcar, Hertz, Redspot and Thrifty are represented at Perth Airport. Desks for these car hire operators are located on the ground floor of terminals.